We have exciting news here at NTB Games: The A game is going Hollywood, and getting a complete makeover! Sometime this month, we’ll be releasing a new version of the A game that will be packed with exciting features and developments! In redesigning the game, we aimed to make it even more interactive and social, while sprucing up its appearance and usability. First and foremost of the changes will be the complete revamping of the look and feel of the A game. Our design team has worked from the ground up to ensure that the new A game will look great, and be easy to navigate and play. We think you’ll love the slick new design! The current A game has 8 categories visible from the main screen. The new and improved version will have a whole slew of categories available to play directly from the main screen, making it no longer necessary to navigate to a separate URL to play specialty games like Harry Potter, Queen, or Tim McGraw! 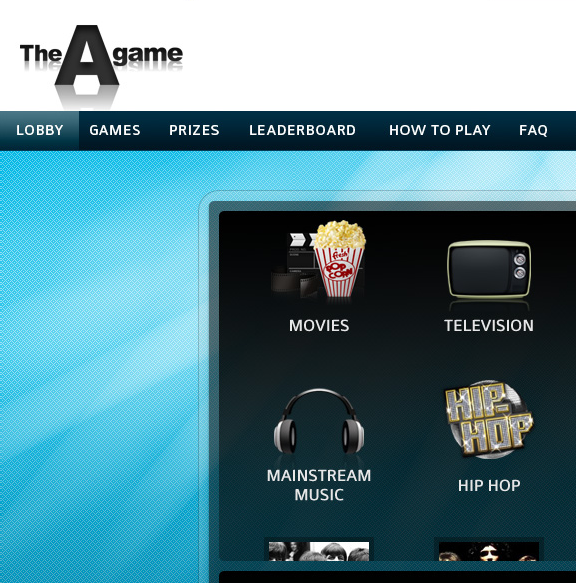 Users of the new A game will start off in the Lobby area. Here they will be able to view their current rank, and start one of the three game modes: Single Player, Random Challenge, or Live Challenge. Also visible in the lobby will be the brand-new chat room, where players will have the ability to heckle each other over their respective scores or just chat about the cool new features. By clicking on an individual user, a private chat can also be started. Another cool addition to the new game will be trophies! 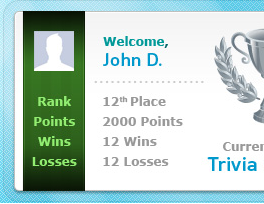 Players can unlock a series of trophies by gaining rank on the leaderboard. These will be visible in the lobby next to the player’s name, will be able to be published to the player’s Facebook wall. At NTB Games, we are constantly striving to give our players the most entertaining and enjoyable experience in playing the A game. It is our hope that the new features and design will make the A game more engaging and fun than ever, and we think you are going to love it too! Awesome! Can’t wait for it to be released! July 2010 Week 4 Winners! July 2010 Week 3 Winners - Busy Week!